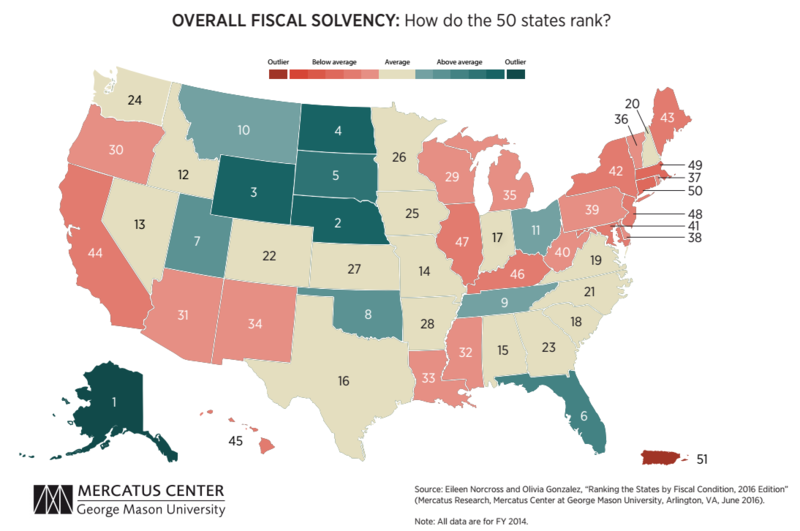 Eileen Norcross and Olivia Gonzalez of the Mercatus Center have released a new report on the fiscal solvency of each of the United States, Ranking the States by Fiscal Condition. Budget solvency. Can a state cover its fiscal year spending with current revenues, or does it have a budget shortfall? Service-level solvency. How much “fiscal slack” does a state have to increase spending if citizens demand more services? Trust fund solvency. How much debt does a state have? How large are its unfunded pen-sion and healthcare liabilities? The report’s 2016 edition updates the rankings for each state through the end of Fiscal Year 2014, so it is a little over a year and a half out of date. That is an important consideration for several of the highest ranking states, because the composition of their economies includes large contributions from the oil and gas industry, which saw revenues plunge along with oil and gas prices in the latter half of 2014 and through 2015. Since Fiscal Year 2014 ended in September 2014, the report would barely capture the first few months of that major change. It will be interesting to see how the fiscal condition of this year’s Top 5 states, Alaska, Nebraska, Wyoming, North Dakota, and South Dakota, might change in next year’s report. The Bottom 5 states, Kentucky, Illinois, New Jersey, Massachusetts, and Connecticut, have big problems that are unlikely to change quickly, and will keep them at or near the bottom of the rankings for some time. 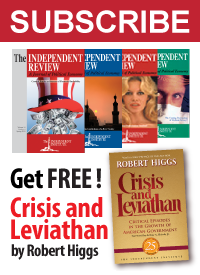 Each state has massive debt obligations. Each of the bottom five states exhibits serious signs of fiscal distress. Though their economies may be stronger than Puerto Rico’s, allowing them to better navigate fis­cal crises, their large liabilities still raise serious concerns. The bottom five states have changed since last year. Kentucky’s position has declined, plac­ing it in the bottom five this year. New York is no longer in the bottom five. New Jersey and Illinois improved slightly, but remain in the bottom five. Connecticut and Massachusetts also remain in the bottom five, in slightly worse positions than last year. If it were a state, the U.S. territory of Puerto Rico would occupy the very bottom of the rankings. But for this edition of the report, the state of Alaska wins the gold medal for its fiscal condition.